← Say the Coolest Things with Fres Mint! This was what hubby and I munched on inside the cinema while watching a movie at SM Megamall last August 2, 2012. 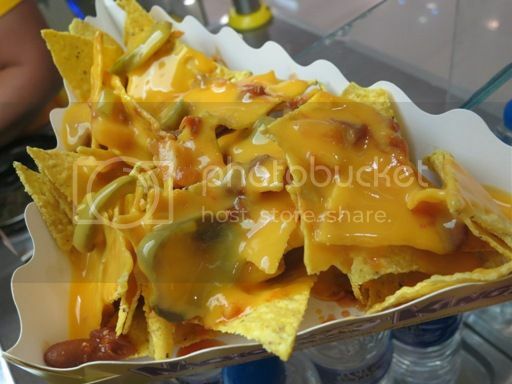 Jumbo Loaded has nacho chips and cheese with four (4) free additional toppings. We chose Beef, Salsa, Jalapeño and more cheese! I ate more of this than hubby simply because I missed Nacho King! The chips were crunchy, the cheese was delicious, and the jalapeños gave this movie snack a little kick. Jumbo Loaded with Coke Zero plus a movie date with hubby is happiness! This entry was posted in Jumbo Loaded, Movie Snacks, Nacho King. Bookmark the permalink. 12 Responses to Jumbo Loaded Nacho King! That’s sheer bliss, I have to agree :). I haven’t had nachos in ages! Now you make me crave :). That would be a perfect snack for my daughter, so she stays away from junk food. ohohoho cheese overload for only P145? im craving for it now! I love loaded nachos! We usually get ours when we watch a movie, too. :) But I want to make some at home, so I hope to do that soon. I love Nachos especially those overloaded with cheese! That’s a great movie snack. It’s always popcorn and soda for us but we could use some nachos, too. I can never say no to cheesy, layered nachos! i miss eating at nacho king! yummy!